Steve Powell’s Red Tornado survived a heck of a fight from Brad Herr’s upstart Buckskins. MILLERSVILLE – Delivering dagger after dagger, the McCaskey trio of Kobe Gantz, Randolph Speller and Jathan Gonzalez slayed an otherwise productive game plan by upset-minded Conestoga Valley Wednesday night. Steve Powell’s Red Tornado survived a heck of a fight from Brad Herr’s upstart Buckskins, pulling away in the fourth quarter for an 86-78 victory in a Lancaster-Lebanon League tournament semifinal at Penn Manor High School. Gantz posted 30 points, 10 rebounds and eight assists, Speller produced 22 points and seven assists, and reserve Jathan Gonzalez popped a career-high 16 points – the trio shared all 14 of the team’s 3-pointers – to push McCaskey through to its second straight L-L championship game and fifth in six years. The Section One champs meet two-time defending champ Cedar Crest Thursday night at 7 at Manheim Twp. 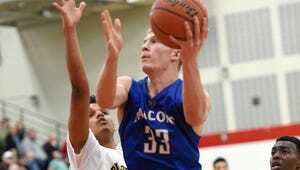 The Falcons, who were swept by McCaskey in the regular season, edged Lancaster Mennonite 58-56 in the other semifinal. “It’s something we usually do all together as a team,” said Gantz, the 6-4 all-state senior, of the team’s game-breaking 15-0 run early in the final stanza. McCaskey (18-5) drilled nine of its 3-pointers in the second half, knocking down nine of 12 at one point. Conestoga Valley (16-8), which gets another shot at McCaskey next Wednesday in the first round of the District 3-AAAA tournament, led 16-10 after one quarter and 33-30 at halftime. Herr’s club picked up 20 points and eight rebounds from Jovan Marrero, 18 points and six boards from Evan Showalter, plus 11 and 10 points, respectively, from Grant Stoltzfus and Jeremy Griel. “Zone ‘em up, rebound, and hope they don’t make outside shots,” said Herr, whose team lost by 20 to McCaskey last month. Gantz, who had been cold from outside in recent games, made five of seven from deep. Speller was five for 12, and Gonzalez made four of six from the arc. CV, with its largest lead of 10-2 in the first quarter, fell behind 73-58 after that 15-0 Tornado swirl early in the fourth. The deficit was 80-69 after a Speller free throw with 1:29 left, but then Marrero scored on a put-back, CV forced a turnover, and Showalter nailed a 3-pointer. Suddenly it was a six-point game. CV had a chance to get closer after Gantz missed a pair of free throws with 40 seconds left, but an unforced turnover spelled final doom. Still, it was an outstanding game, lightning-quick pace, and the teams will do it again in a week, regardless of what happens with McCaskey Thursday night. Austin Monroe 1 0-0 2, Connor Whitacre 3 3-4 9, Evan Showalter 7 2-2 18, Jovan Marrero 8 4-5 20, Jeremy Griel 2 5-5 10, Theo Blantz 0 0-0 0, Trevor High 1 0-0 3, Tristan Thomas 2 0-0 5, Grant Stoltzfus 4 0-0 11. Totals — 28 14-16 78. Kobe Gantz 8 9-12 30, Ricky Cruz 2 2-2 6, Izaiah Baratta 1 0-0 2, Greg Nunez 3 0-1 6, Randolph Speller 6 5-6 22, Jathan Gonzalez 6 0-0 16, Skyler Davis 0 0-0 0, William Joseph 2 0-0 4. Totals — 28 16-21 86. 3-point goals — CV 8 (Stoltzfus 3, Showalter 2, Griel, High, Thomas); McC 14 (Gantz 5, Speller 5, Gonzalez 4).